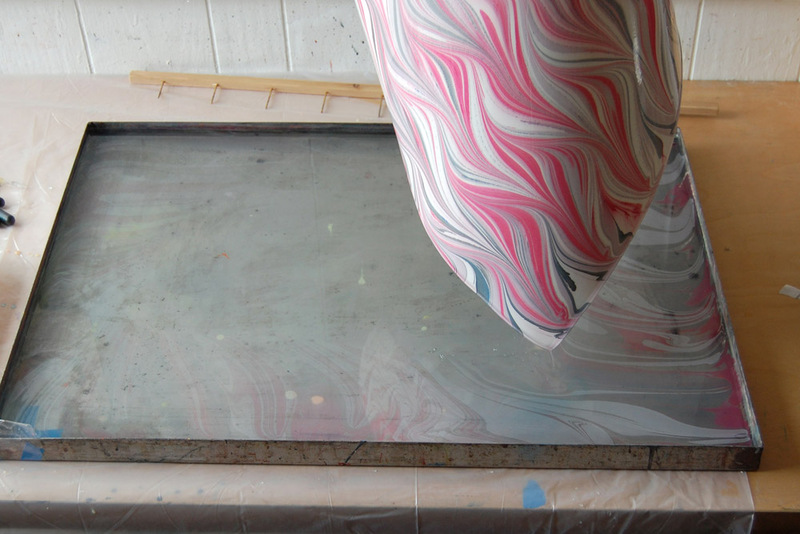 The choice of paper stock is essential to the success of a marbled print, but information on just which paper characteristics and brands to seek out is scarce. 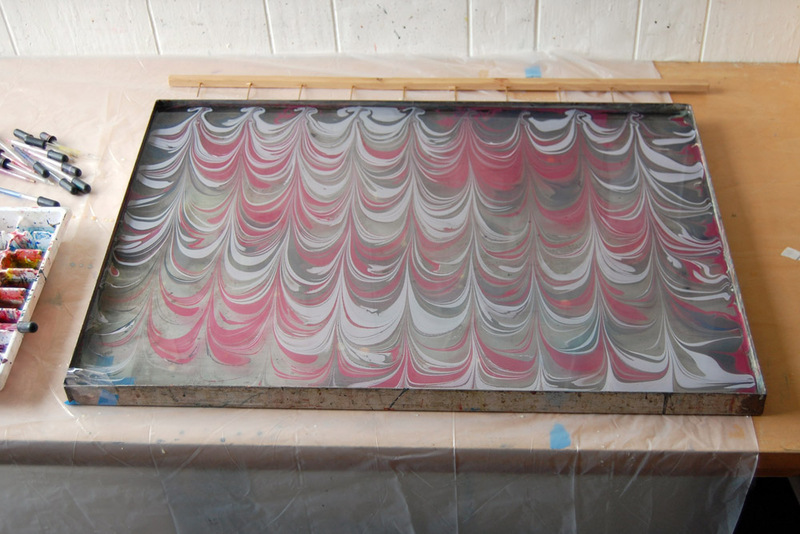 Today I’ve assembled twelve different papers to test in the marbling tray and shed a light on this topic! Some of these papers are my studio standards, some I know are favored by other marblers, and some I’ve chosen simply hoping they’ll perform well. While by no means an exhaustive trial, my aim is to find a few reasonably priced medium and heavy weight papers suitable for marbling with both watercolor and acrylic paints, and provide examples of what to look for in selecting and testing paper stock. When you’re looking for a paper to marble, it should generally be an absorbent, lightly sized, uncoated stock. This may be a drawing, printmaking, or sketch paper. I’ve found that alpha cellulose, cotton, and recycled fibers tend to work well because they are absorbent but have decent wet strength. 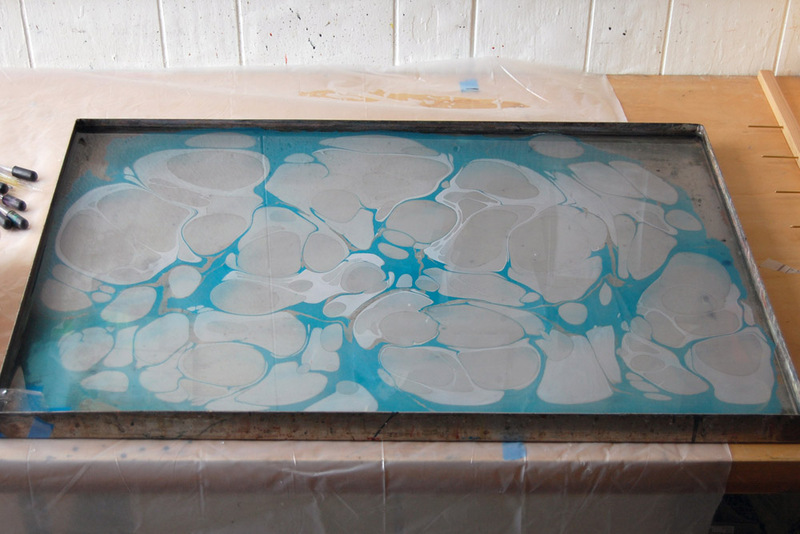 I like to print on a medium or heavy weight paper less prone to wrinkling at each stage of the process, but the thickness should be governed by the end use of the marbled sheet. 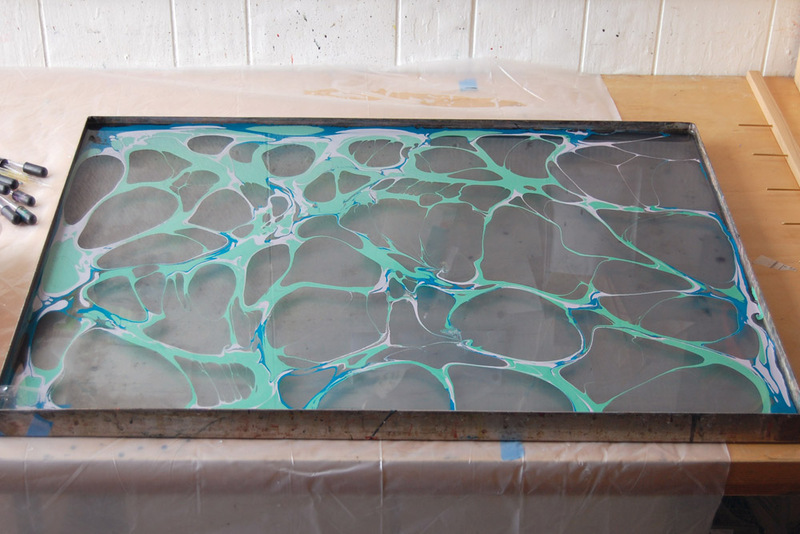 When judging a marbled sheet, look for even absorption of the pattern, crisp edges to the lines and forms, and good retention of dark colors. Any areas of negative space where the paper shows should rinse clear and bright. 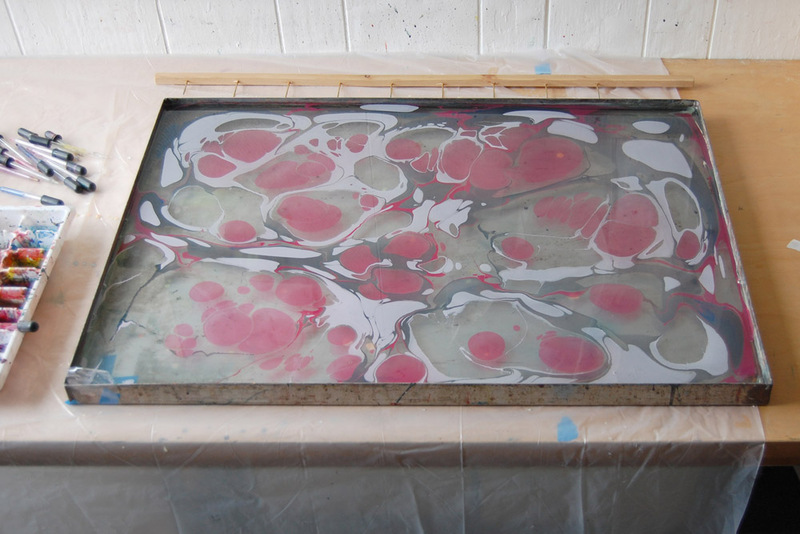 The examples above have been pre-mordanted with 2 teaspoons alum/pint of water, then marbled with watercolor paints. The majority of the papers I chose to test marbled very nicely with watercolor paints in a medium value range. 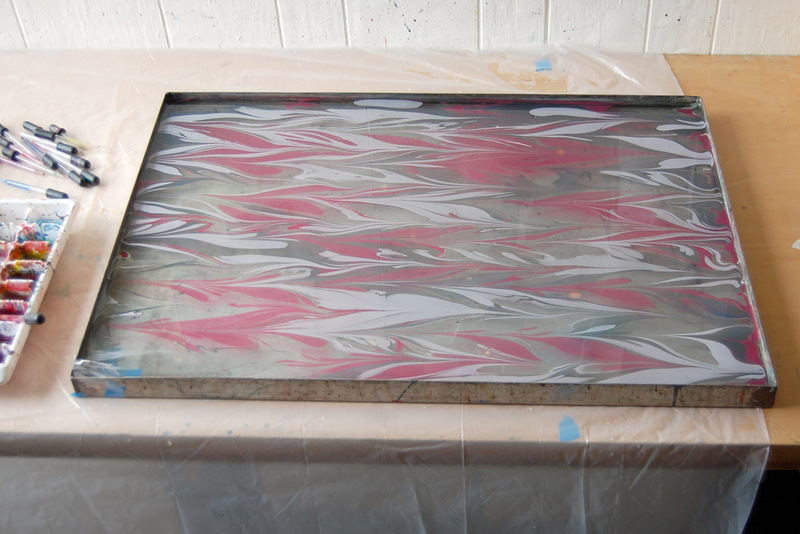 To really separate the wheat from the chaff, I chose to pattern my acrylic samples with a high contrast pattern. Printing dark or saturated colors next to bright white can be very tricky, and demands a more particular paper stock. I was impressed by the multiple size and weight options for this second group of papers, all at a very reasonable price point, as well as the option to choose post-consumer recycled fibers. Do note that to make a very saturated print, the paper may need to be left on the size longer than usual, about 30-60 seconds. Most of the papers I chose to test are lightly textured and bright white. Of course there are many lovely toned and textured papers that also marble beautifully, with the base color or texture underlaying and unifying the pattern. This is certainly not an exhaustive trial, and the availability of the recommended papers may be limited. There are many wonderful papers yet to try, and a perfect paper for every application. Please use the guidelines above to assist you in choosing your own papers for marbling, and feel free to comment here with your results! When I teach indigo and shibori dyeing courses, I make certain to include some basic itajime folds for students to experiment with. This Japanese resist dyeing technique involves folding fabric into a grid of repeating geometric shapes and applying clamps, which creates a beautiful tessellating pattern after dipping or submerging in dye. We usually learn three patterns in class, but I recently discovered a fold new to me, with the help of a student! Before sharing it here, I’ll give a quick overview of the basics. Each of the itajime patterns begins in the same way, with an accordion fold to pleat the fabric into a long thin rectangle. The easiest pattern, sankaku, repeats the accordion fold in the opposite direction, making a grid of squares or rectangles. The other three patterns I’m familiar with rely on pleated triangles. Below is a reminder of the geometry I’ll be referencing. Whichever of these patterns you are making, it helps to be as precise as possible when folding your fabric. 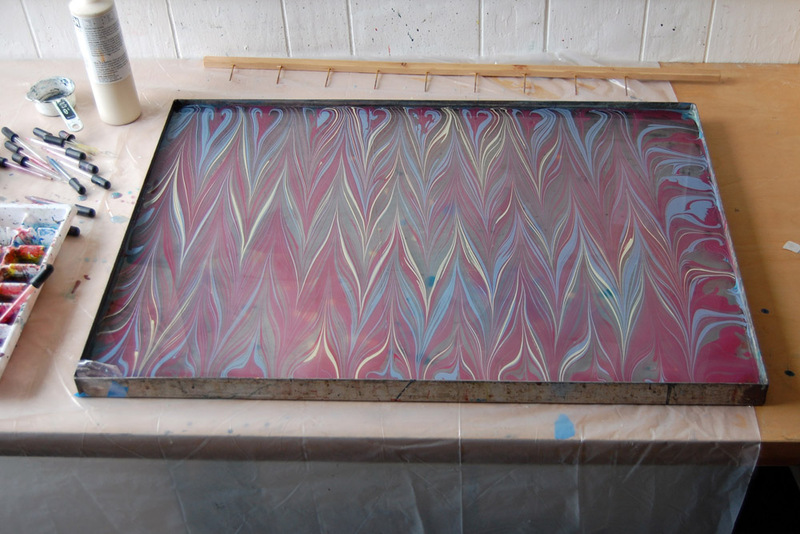 This will give you a uniform pattern the dye can evenly penetrate. I recommend practicing with a piece of scrap paper before folding fabric. Then you can choose to fold your wet fabric, or iron it into crisp shapes before wetting and dyeing. I find it easier to flip the paper over after each step when learning a new pattern, but once I’m comfortable with the steps and move to fabric I hold it in one spot and pile the folds up on top of one another. The lattice pattern, gōshi, is made with a pleated right triangle (just like spanakopita, but with an accordion fold). This creates a grid of squares with diagonal lines running through them. The tortoiseshell pattern, kikkō, is made of tessellating equilateral triangles. Together these triangles form a grid of hexagons. See in the diagram below that the first fold A forms only half of the equilateral triangle, which is a right triangle with its sharpest point nestled in the corner of the pleated rectangle. The fabric is flipped over and the second fold B creases at what is now the obtuse angle, aligning A exactly with one side of the pleated rectangle. The equilateral triangle continues in an accordion fold with no more half-triangles. 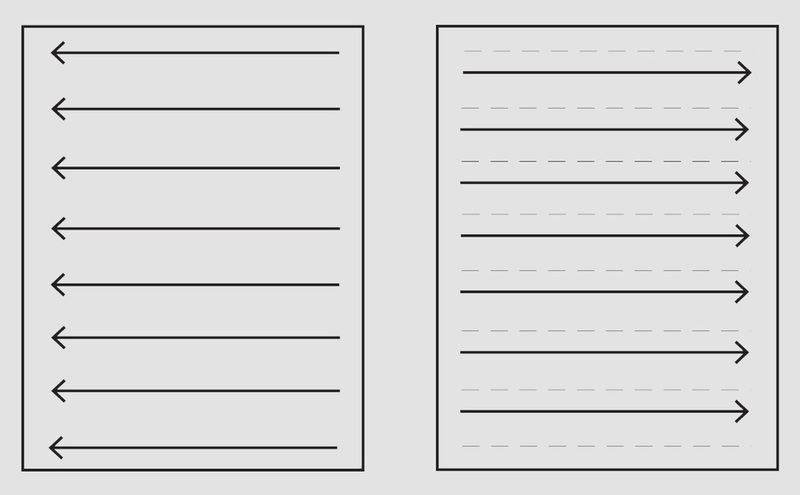 My new favorite fold is one that I cannot find mentioned in the texts I have on itajime. It creates a six pointed star just like the hemp leaf pattern I’ve seen in stitched shibori, asa-no-ha. This pattern begins with the same fold A as the previous, creating a right triangle. Fold B creases on the acute angle of the reverse, forming a long thin isosceles triangle. Together folds C and D form only half of the isosceles triangle, then E and F continue with the full triangle. Every fold flexes at the acute angle, so keep it precise. This pattern has a very large repeat, so you’ll want a big piece of fabric to show off the full pattern. I’ve tried my best with the diagrams, but there is no better way to figure this one out than by attempting it! 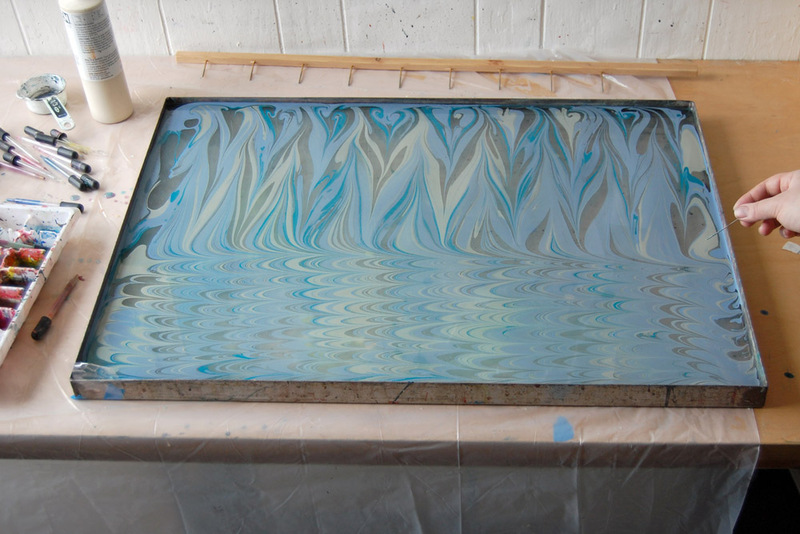 After discussing Indigo as Pigment, I’ve had a lot of requests to share the process for making Maya blue. This recipe is based on the research of Michel Garcia, whose Natural Dye Workshop DVD series I recommend. To make Maya blue pigment at home, only two ingredients and a few tools are required. Botanical indigo powder: This can be store-bought or home processed, and must be thoroughly dry and finely ground. Clay substrate: Sepiolite, palygorskite or attapulgite will absorb the indigo when heated. You can purchase small jars here, or larger amounts here. If your clay is granulated of foraged it must be finely ground. Mortar and pestle for grinding: This must be dedicated to crafts only, never food. Dust mask: These types of clay can be irritating. Small pot: Likewise dedicated to crafting. 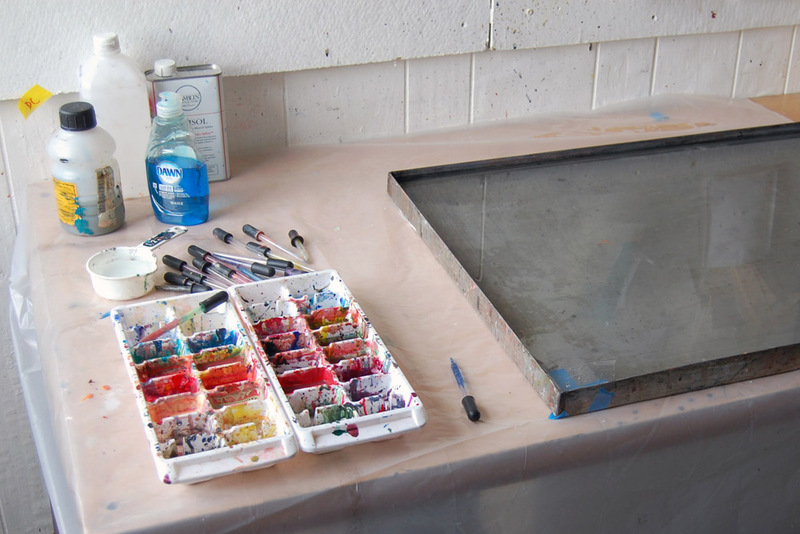 Mulling slab and muller: For extra finely grinding the finished pigment and mixing paint. Make certain that none of your tools have any water on them, as even a drop will spoil the reaction. After finely grinding, weigh 10 parts clay and 1 part indigo powder. I have used 30 grams sepiolite and 3 grams indigo. Combine these in a small pot and heat over a medium low flame. Over the course of a few minutes, you will see the two powders combine and turn a uniform blue color. At 356 degrees Fahrenheit the indigo sublimates to a gas, bypassing the liquid phase, and is immediately absorbed by the clay. Remove the pot from heat and allow to cool. 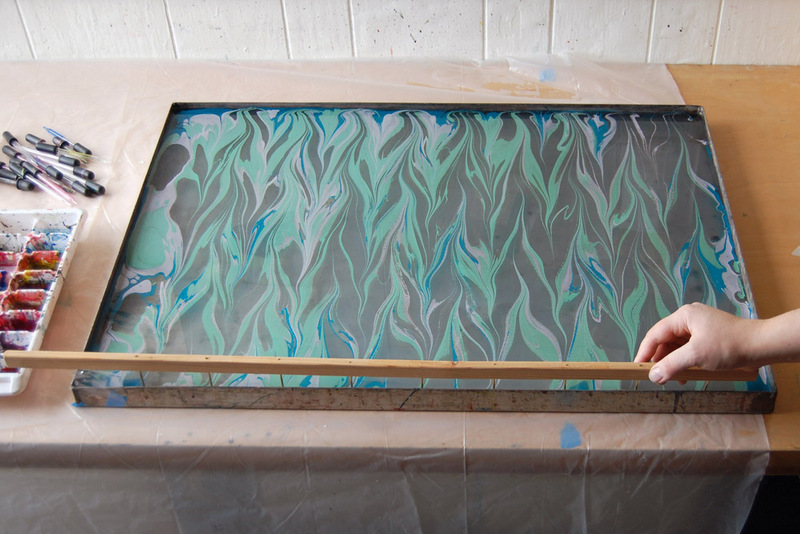 The color will have a violet tinge when hot, but turn turquoise as is cools. You now have Maya blue pigment, indigo locked inside and stabilized by the clay. C Mixture after heating: Maya blue! Maya blue pigment may be stored indefinitely. To use as paint it must be finely ground with a mortar and pestle followed by mulling with a binder to mix the paint of your choice. 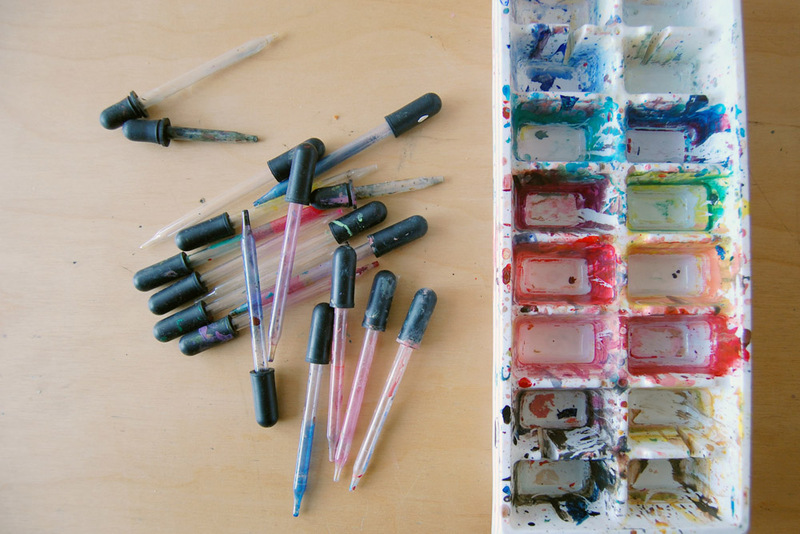 Check out Kremer Pigments and Kama Pigments course offerings and videos to learn how to prepare your own watercolor, egg tempera, or oil paints. 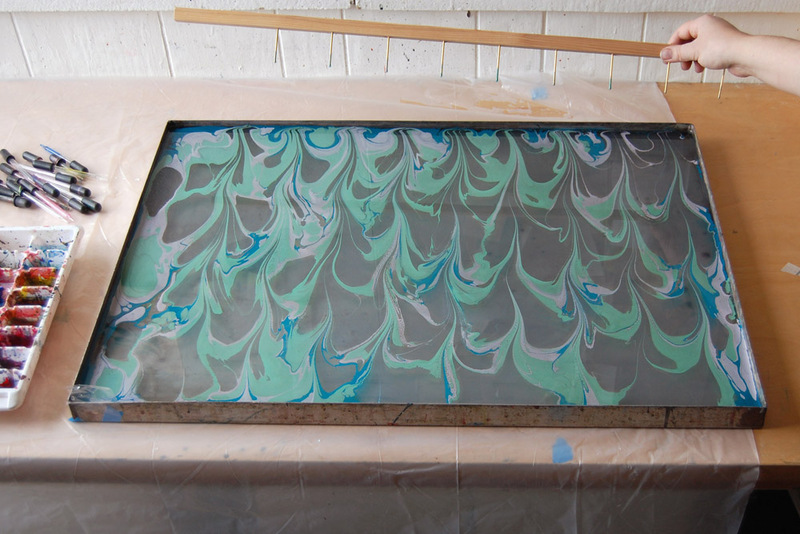 Now we come to some exciting compound patterns in our series of marbling pattern tutorials. These rely on a series of basic patterns repeated one after another. 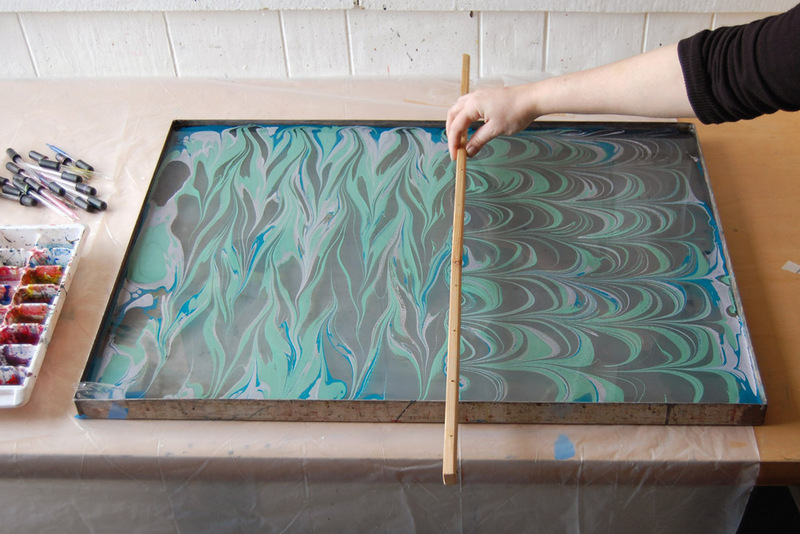 For the most uniform results, use a set of marbling combs and keep your hand steady, with your eyes focused on the movement of just one tine through the pattern in the vat. Of course, you can achieve similar but more organic results by drawing with a stylus. Remember, the diameter of the stylus will impact the line quality, and the spacing of the pattern at each step will influence the outcome, so feel free to play with the scale along the way. And, lastly, remember to take your paper grain into account when planning out the pattern. The feather pattern begins with a getgel, continues with the nonpareil, and is completed with a widely-spaced getgel. The getgel at left is followed by the nonpareil. Then follows a widely-spaced getgel (about 3"), perpendicular to the nonpareil pattern. Having completed the getgel, the nonpareil is now drawn with a stylus or a nonpareil comb. Perpendicular to the nonpareil stripes, this is followed by widely spaced parallel lines. 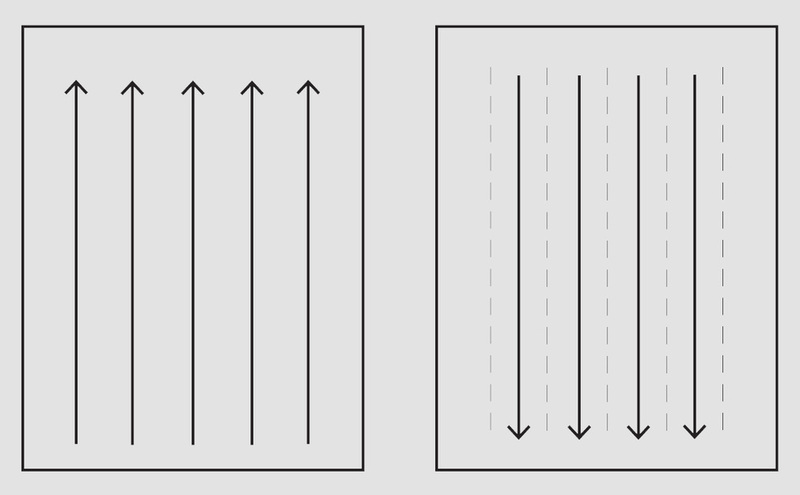 In the spaces between these lines, another series of parallel lines are drawn running in the opposite direction. And the feather pattern is complete! 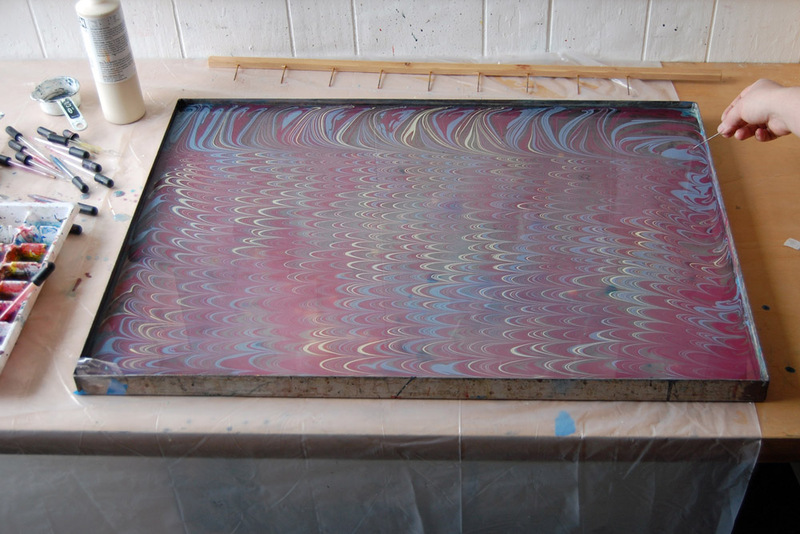 Today our series of marbling pattern tutorials brings us to the nonpareil pattern, from the French "without equal". Though truly the nonpareil is not one of my favorites, it is a step towards some further compound patterns whose elegant line quality depend on it. This pattern requires a nonpareil comb, whose tines have 1/8" or 1/4" spacing - but if, like me, you don't have such a comb you may carefully use a stylus. This gives a looser, less static quality to the pattern. 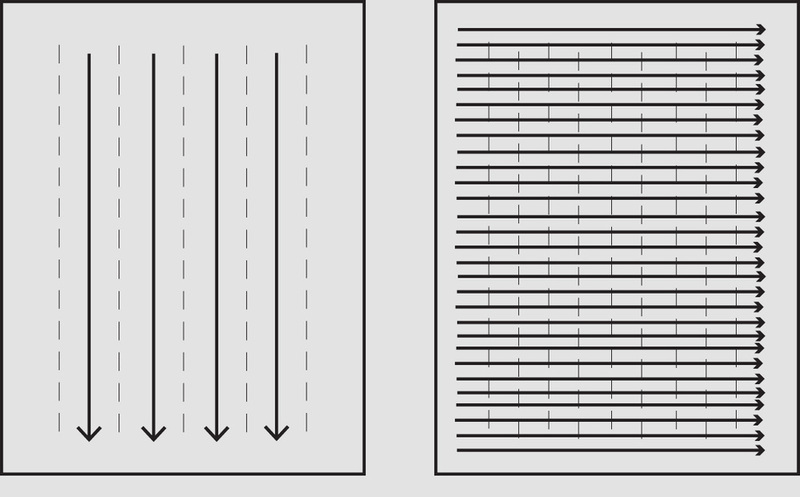 Complete a getgel pattern (at left above), then draw a series of tightly spaced parallel lines perpendicular to it. The nonpareil pattern begins with a getgel, which may be repeated once or twice for finer lines. Remember before beginning to make a note of your paper grain direction, and do some strategizing so that the completed pattern will be oriented as you wish. Working perpendicular to the existing pattern, pass your nonpareil comb through the pattern once or draw a series of closely spaced lines with a stylus. I did not pull a print of this pattern, but continued working on it. 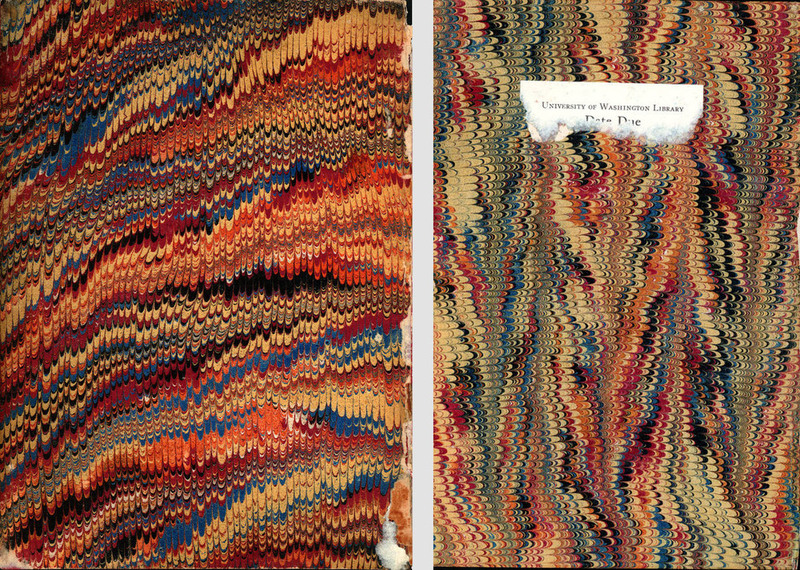 However, below are some lovely vintage examples of the nonpareil from the digital collection of the libraries of the University of Washington, which also illustrate the effect of pattern orientation. 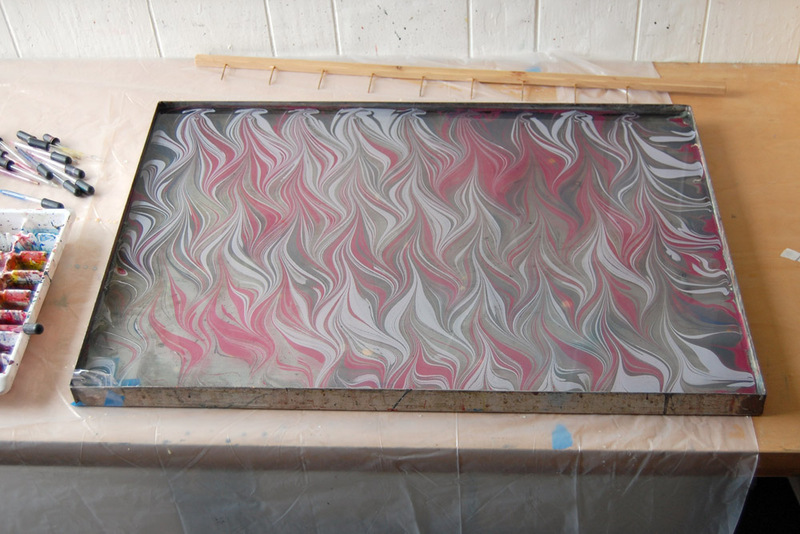 Continuing the marbling pattern tutorials, we next come to the waved getgel. This pattern is very similar to and begins with the getgel, only replacing the straight parallel lines with waved ones in the final step. 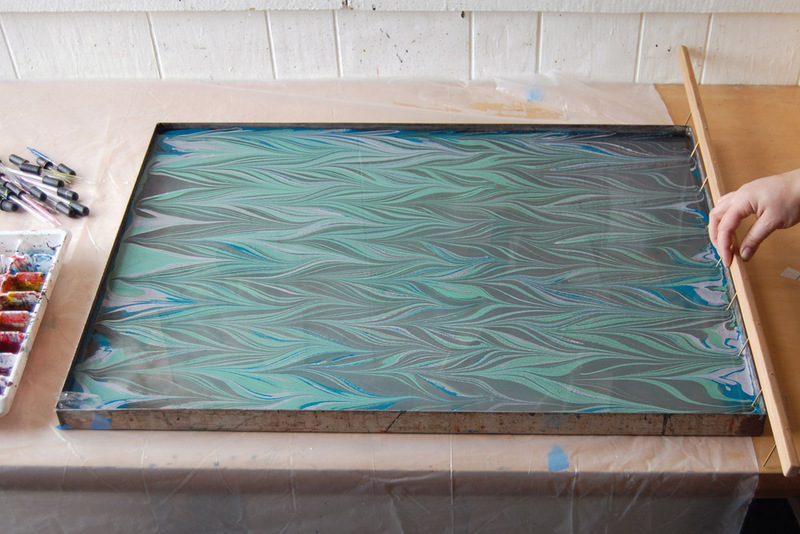 In the studio, begin by throwing down your chosen colors in a stone pattern. Complete the getgel pattern once, as above (or twice for very fine lines). Then, working perpendicular to the existing pattern, draw another series of parallel lines. Moving the opposite direction, bisect those lines with a series of parallel waved lines. And the waved getgel is complete! There are a wide variety of formal, often combed, marbled patterns, each with its own history. I thought I'd embark on a series of posts illustrating the process of creating a few of these patterns, which are much simpler to produce than they appear. These are by no means historically accurate examples, nor an exhaustive survey - for that I can recommend Anne Chamber'sThe Practical Guide to Marbling Paper, Iris Nevins' Traditional Marbling, or Patty & Mimi Schleicher's Marbled Designs: A Complete Guide to Fifty-Five Elegant Patterns. A few notes on my materials and process: Many types of pigments, sizes, and surfactants are used by marblers, each according to his or her preference. I work with acrylic paints on caragheenan, using Dawn or Photo-flow as needed. I find that an ice cube tray makes a perfectly-sized palette, and like glass pipettes rather than disposable ones. Uniformly repeating patterns rely on a variety of rakes or combs with evenly spaced tines, ranging from 1/8" to 1 1/2" apart. I often prefer to hand draw the pattern with a stylus, which gives a less static appearance (and is freeing!). The diameter of the stylus does impact the line quality, while the distance between the lines drawn will have a marked impact on the scale of the finished pattern. 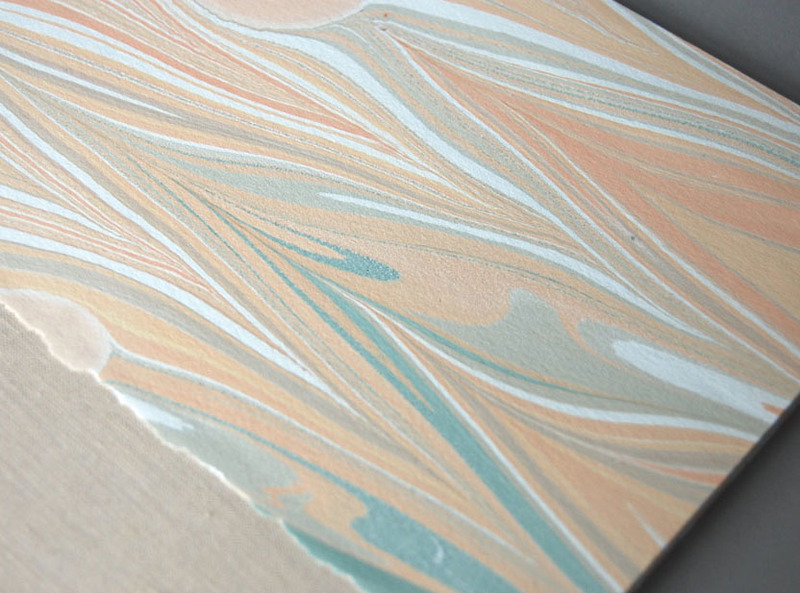 If you are marbling paper destined for bookbinding, make a note of the grain direction before beginning so you can plan the direction of the pattern accordingly. One of the primary marbled patterns is the getgel, from the Turkish 'go and come'. Pictured above in an example created with a stylus. While fetching in its own right, the getgel is also the foundation for many other combed patterns. It is simply a series of parallel lines, bisected by a series of parallel lines running in the opposite direction. The getgel pattern can then be repeated at right angles to the first pass, which will create finer, more delicate lines of color. In the studio the getgel pattern begins by throwing down a few colors, each addition driving the prior color into dense veins. Followed by the combing process - a little shaky this morning. The getgel is now complete, but I'd like to repeat it for finer lines and more uniform color dispersal. And there you have it, the getgel pattern! The kettle stitch, which holds the tension along each signature and acts as the change-over for many bindings, is a persnickety little stitch until you get the hang of it. When learning the coptic or sewn-to-tape bindings a common problem is an incorrect kettle stitch that does not 'lock' the tension, or a kettle so successful it cinches the head and tail while the center of the spine bows outward. These diagrams illustrate how I execute the kettle stitch, along with a trick for regulating the sewing tension both along the spine and between the signatures. On reaching the head or tail of a signature, I exit the last sewing station, make certain the thread is nicely taught, then clamp down with a forefinger on the fold about 1/2" inside the last sewing station. The thread (and tension) is held firmly by this finger, and the end of the signature pops up just a bit. That tiny bit of extra space will prevent the kettle from cinching too tightly. I hold this position until the kettle stitch is completed with my other hand, locking the thread in place. To execute the kettle stitch while holding this posture may seem acrobatic at first, but it can be easily done using the technique recommended in Non-Adhesive Binding, Volume III by Keith Smith. Having made certain to place the sewing stations a distance from the head and tail that is shorter than the length of your needle, its point will emerge from between the signatures and can be pulled through the loop in one easy motion. To tighten the kettle stitch keeping that extra iota of space, pull the thread straight upwards. And finally, release the finger that has been clamping your signature down all this while. Another helpful technique is the french link stitch, which regulates the tension across the spine (between the signatures) by linking each stitch spanning a tape to its neighbor. The french link stitch is an extra step, but the herringbone-like pattern it creates can be a lovely addition to an exposed spine.